Columbus Craft Meats was founded in 1917 by a pair of Italian immigrants in a 2-room flat in San Francisco’s Italian neighborhood. Originally named the San Francisco Sausage Co., the founders opened and closed windows, using San Francisco’s climate to aid in the curing and drying process for the salami. The name was changed to Columbus Craft Meats after it expanded to a location off Columbus Avenue in San Francisco. Fast forward to today, and Columbus Craft Meats produces a wide portfolio of premium meats, including salami, deli meats (turkey, ham, roast beef and chicken) and Italian specialties such as prosciutto, pancetta and mortadella for grocery, club, foodservice and even e-commerce. In October 2017 Hormel Foods Corp., Austin, Minn., entered into a definitive agreement to acquire Columbus Craft Meats’ parent company Columbus Manufacturing, Inc. from Chicago-based Arbor Investments for approximately $850 million. 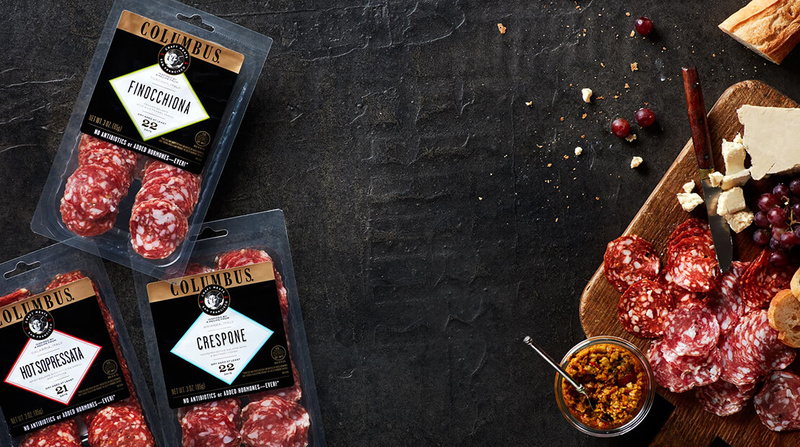 Over the past two years, Columbus Craft Meats has been moving aggressively to shift its products to antibiotic-free (ABF) meat. This started last year with a line of sliced deli meat, and is complimented by the launch of an ABF sliced salami line, a team of protein snacks, a line of paninos, which are rolled slices of salami and cheese, and Salami & Crisps snacks, which pair salami slices with crunchy cheese crisps.